How to explain what Gæðingafimi stands for. It is a form of Dressage Test which is getting more and more interest in Iceland. And because the possibility to follow the Icelandic Master league (www.meistardeild.is) through the internet it gets also more attention all over Europe. Gaits, energy, calmness, preciseness, all together forming a flow from being in calm walk on the long rein to fast tempo tölt or flying pace. And isn't that what we all love about "our" Icelandic horse? The variability of it. So in the end Gæðingafimi not just stands for another test to compete in. It is a way of viewing daily training and having all possibilities from competing on the oval track in gait test to Dressage or cross-country riding, because in the end training for Gæðingafimi includes all different aspects of each and every horse and its talents. This brought together in a fluent show is the goal of Gæðingafimi. So if you are interested to know more feel welcome to one of the clinics I’ll be holding on this topic. 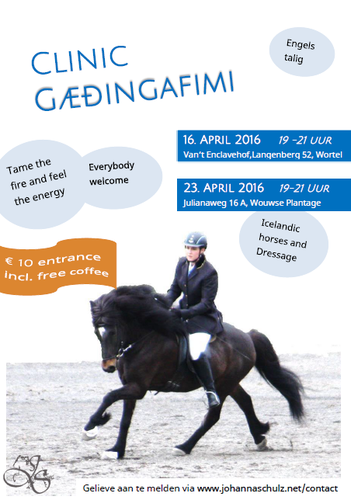 Take an evening off, meet people with the same interest and let me and my horses introduce you to the Gæðingafimi. To enroll please don’t hesitate to write me a short message via the Contact site to which event you would be interested to come. We komen graag met twee personen naar de clinic aanstaande zaterdag.